SHAY JUST MIGHT HAVE THE X FACTOR FOR A CAREER IN SHOWBIZ! 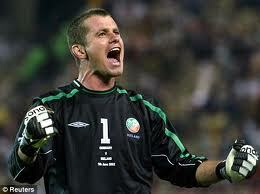 He has the looks and the moves but could Shay Given be about to start a new career in pop music? The Lifford soccer star was at the final of X Factor last weekend as a guest of pop Svengali Louis Walsh at Wembley. And Shay obviously looked the part with his trendy haircut and designer clothes. So much so that X Factor judge Kelly Rowland mistook the Donegal shot-stopper for Westlife star Nicky Byrne. The former Destiny Child star came over the Shay after the live TV final and congratulated Shay on his superb vocals. A rather red-faced Shay, who was with wife Jane, could only smile and agree with her. Louis Walsh thought the entire episode was hilarious. “We he does have the boyband looks although I haven’t him singing just yet,” he laughed. Louis had invited Shay and Jane to the final a his guest so he could support Nicky and the rest of the Westlife lads. Nicky and Shay have become good friends as Nicky was a former soccer apprentice with Leeds United.